During the processing pipeline, the number of reads in a file are counted and saved in a separate text files. The script gather-total-counts.py compiles all these counts and extracts the relevant variables from the filename. 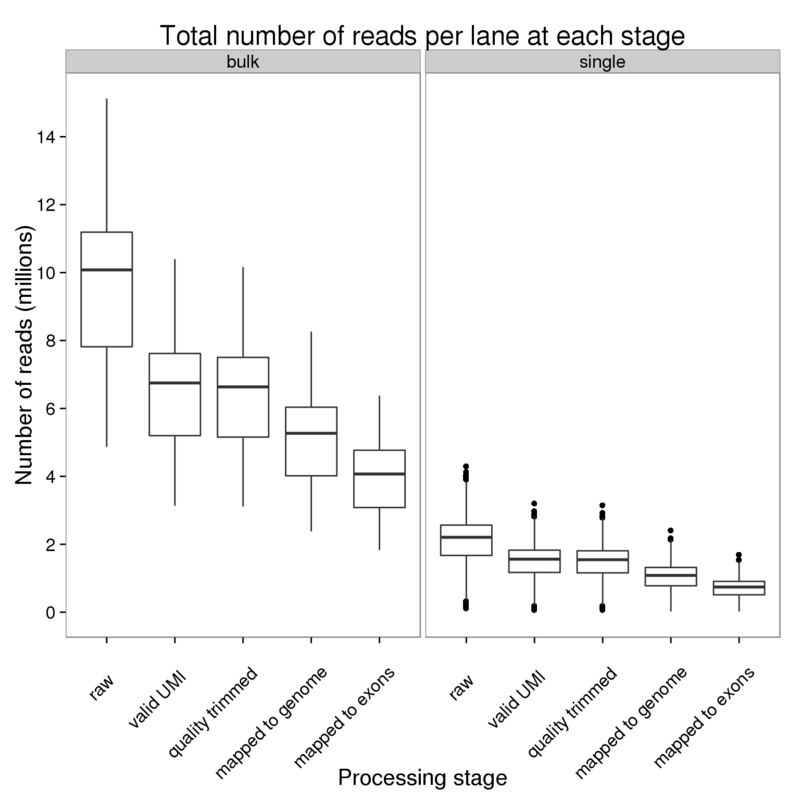 Plot the number of reads per lane at each processing stage faceted by bulk versus single cell sequencing. 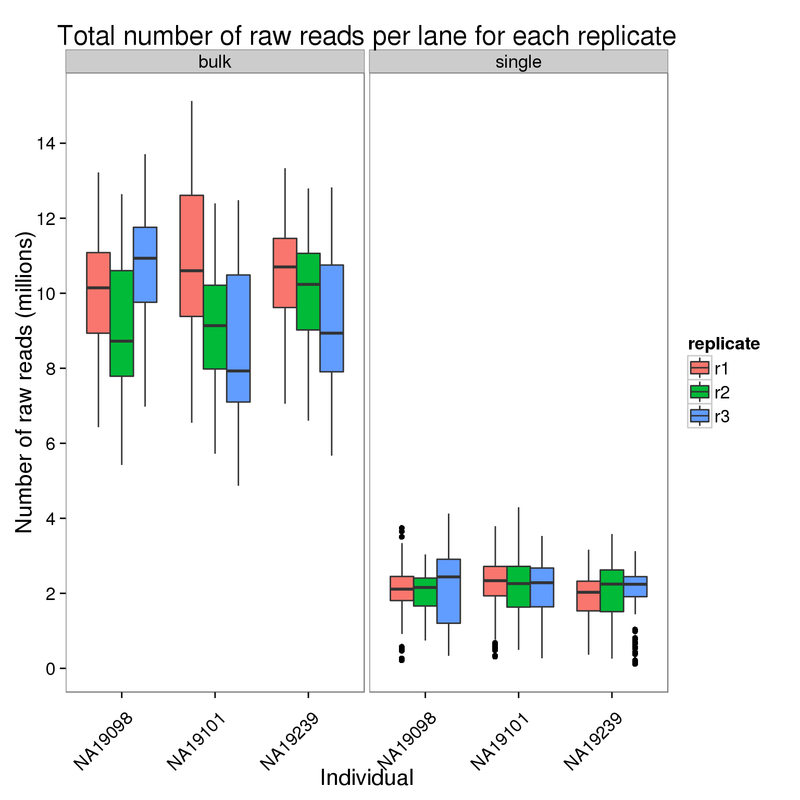 Plot the number of raw reads per lane for each replicate of each individual faceted by bulk versus single cell sequencing. 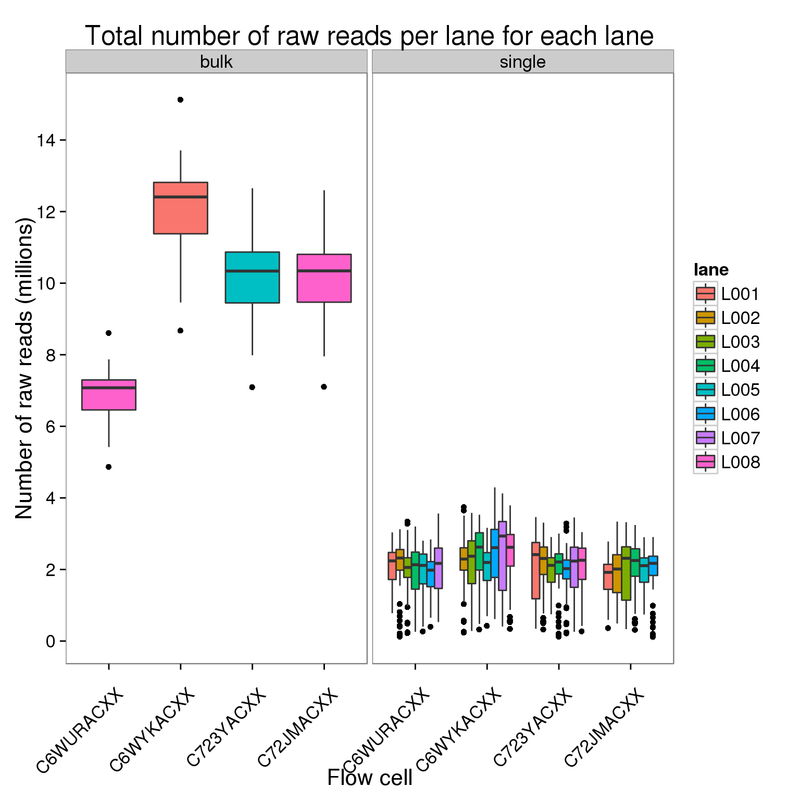 Plot the number of raw reads per lane for each lane of each flow cell faceted by bulk versus single cell sequencing. 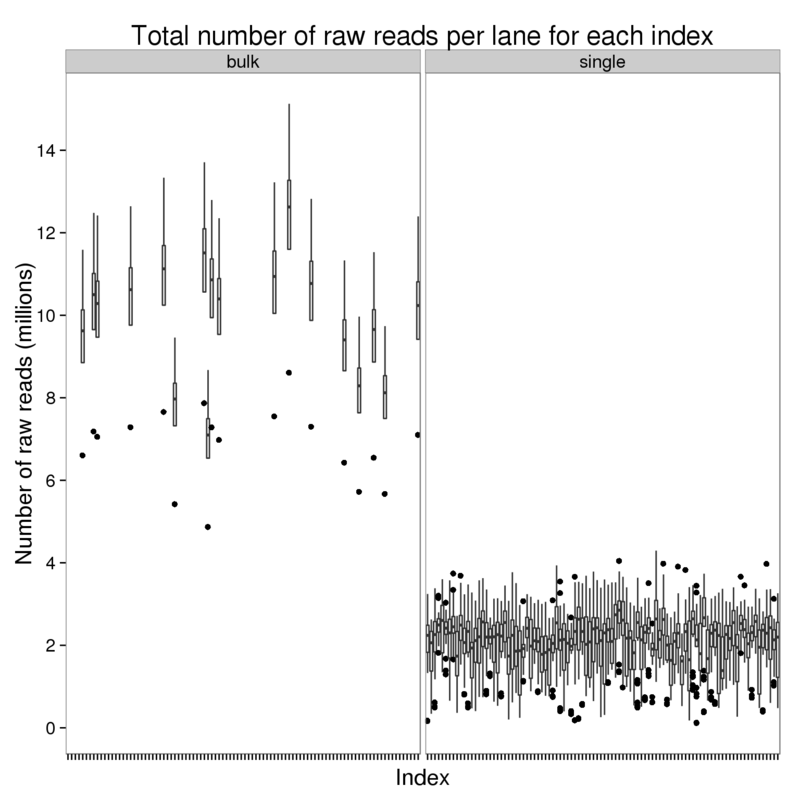 Plot the number of raw reads per lane for each index faceted by bulk versus single cell sequencing. 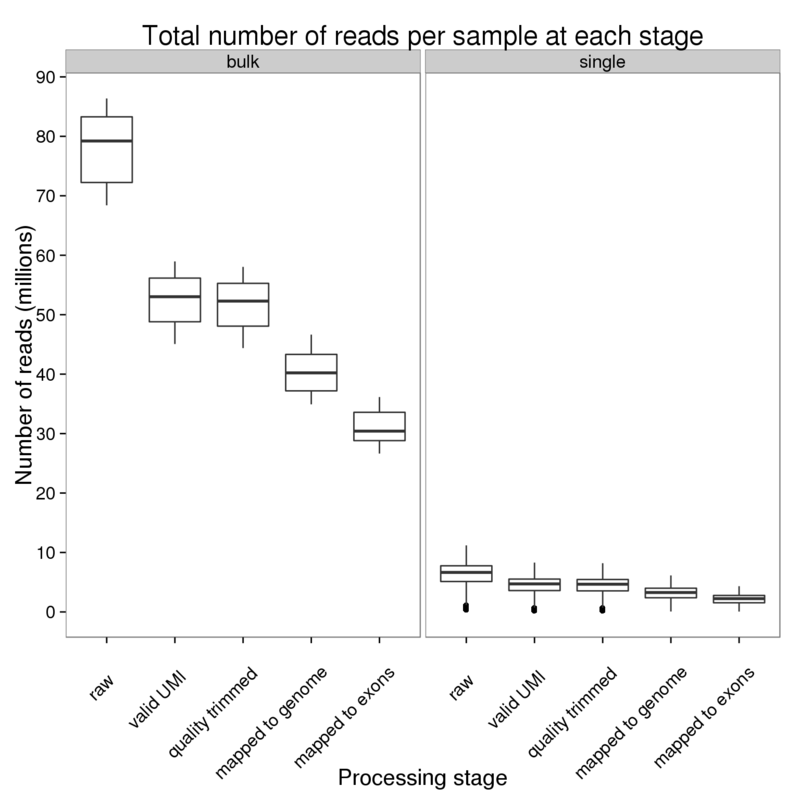 Plot the number of reads per sample at each processing stage faceted by bulk versus single cell sequencing. 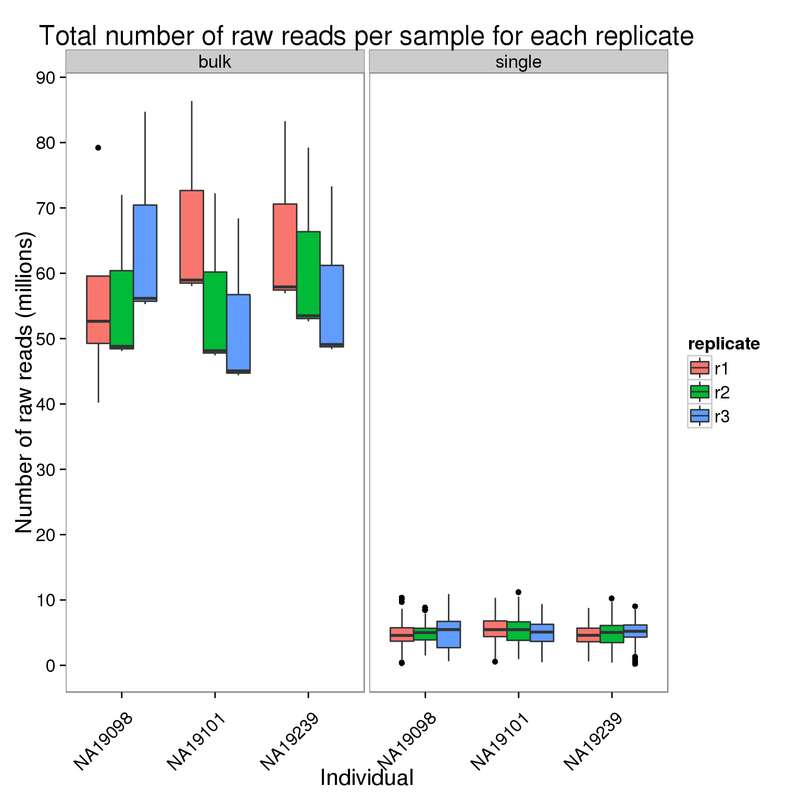 Plot the number of raw reads per sample for each replicate of each individual faceted by bulk versus single cell sequencing. 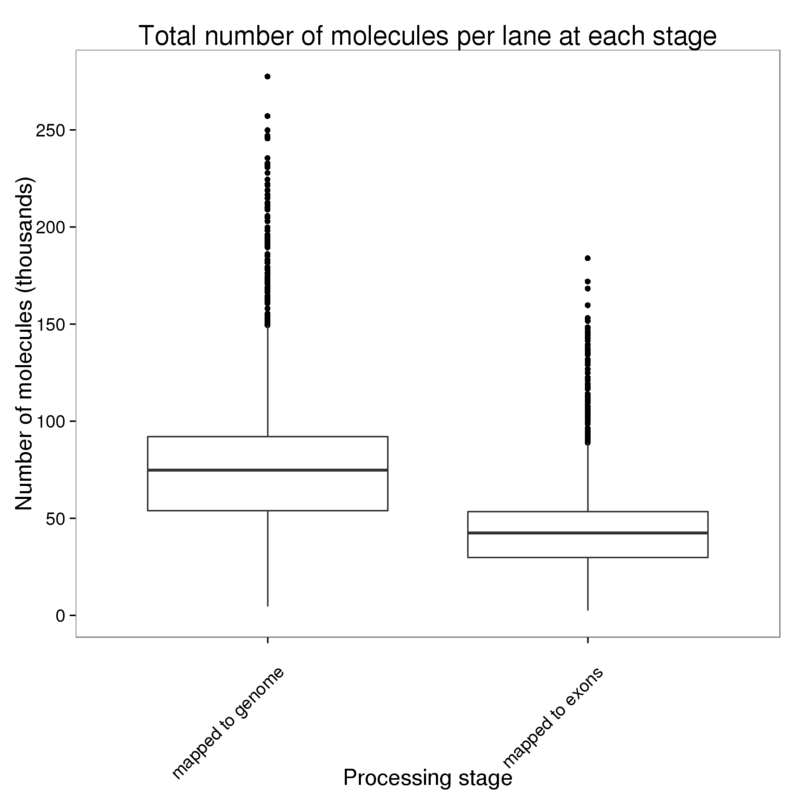 Plot the number of molecules per lane at each processing stage. 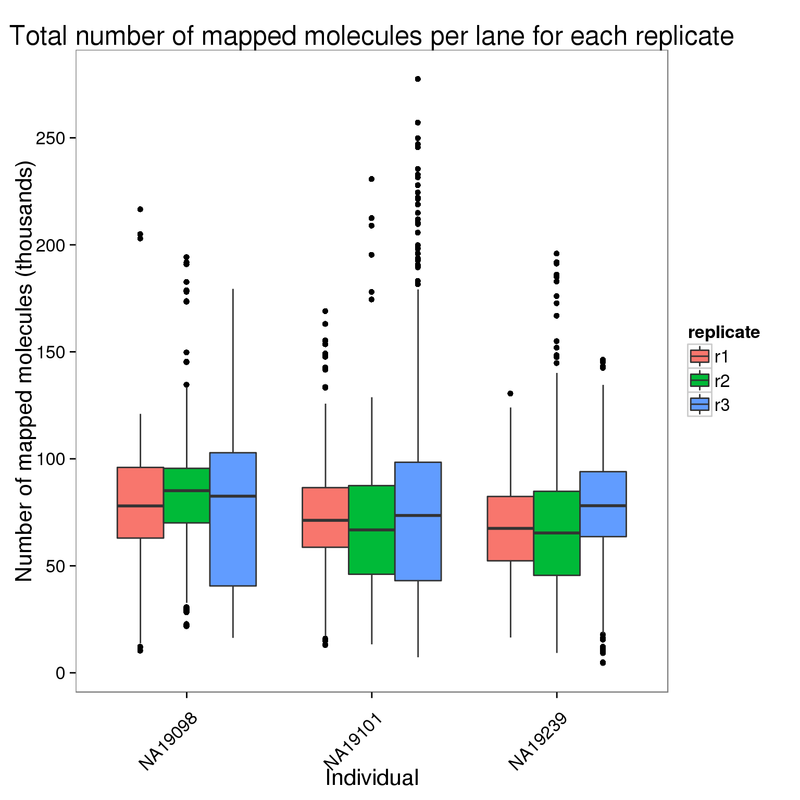 Plot the number of mapped molecules per lane for each replicate of each individual. 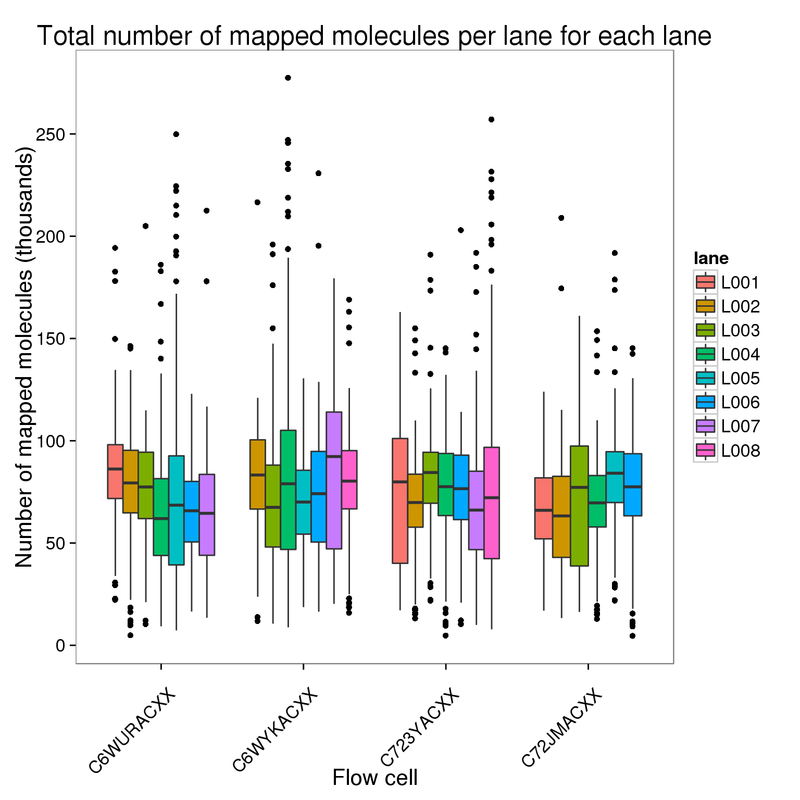 Plot the number of mapped molecules per lane for each lane of each flow cell faceted by bulk versus single cell sequencing. 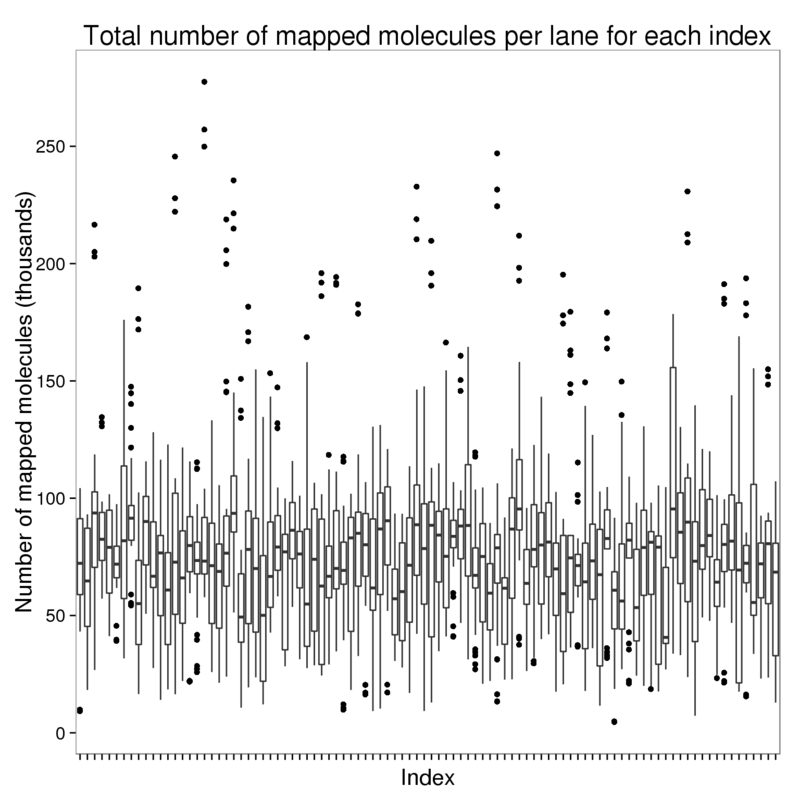 Plot the number of mapped molecules per lane for each index faceted by bulk versus single cell sequencing. Plot the number of molecules per sample at each processing stage. 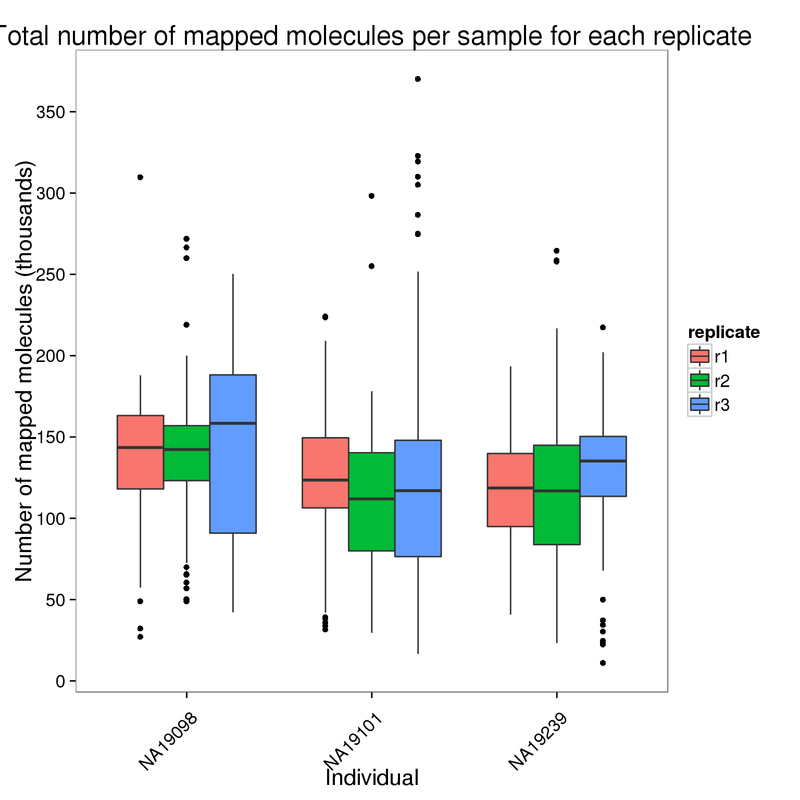 Plot the number of mapped molecules per sample for each replicate of each individual. These summary statistics include low quality cells that are removed before downstream analyses. We obtained an average of 6.28 +/- 2.11 million raw sequencing reads per sample (range 0.361-11.2 million reads). We obtained an average of 2.1 +/- 0.879 million sequencing reads per sample that mapped to protein-coding exons (range 0.0552-4.33 million reads). We obtained an average of 68.1 +/- 28.2 thousand molecules per sample that mapped to protein-coding exons (range 6.03-235 thousand molecules).